Original publication date: Sunday January 28, 2007. A close up of loops in a magnetic active region. These loops, observed by STEREO's SECCHI/EUVI telescope, are at a million degrees C. This powerful active region, AR903, observed here on Dec. 4, produced a series of intense flares over the next few days. NASA's twin Solar Terrestrial Relations Observatories (STEREO) sent back their first images of the sun this week and with them a view into the sun's mounting activity. 'We're absolutely thrilled. We've been looking forward to STEREO's unique vantage point for over 10 years now and the community couldn't be happier with these first views,' said Michael Kaiser, STEREO project scientist at NASA Goddard Space Flight Center, Greenbelt, Md. After a successful launch on Oct. 25 from Cape Canaveral Air Force Station, Fla., STEREO spent the first few minutes separating from its stacked configuration aboard the single Delta II rocket. Shortly afterwards, mission operations personnel at The Johns Hopkins University Applied Physics Laboratory, (APL) Laurel, Md., monitored the two observatories as they traveled in an elliptical orbit from a point close to Earth to one extending just beyond the moon. 'STEREO is the first mission using the moon's gravity to redirect multiple spacecraft, launched aboard a single rocket, to their respective orbits,' said Ron Denissen, APL STEREO project manager. On Dec. 15, 2006, mission operations personnel at the laboratory used lunar gravitational swingbys to alter the spacecraft orbits, redirecting the 'A' observatory to its orbit 'ahead' of Earth. The 'B' observatory will swing past the moon a second time on Jan. 21, redirecting it to an orbit 'behind' Earth. The two will orbit the sun from this perspective, separating from each other by about 45 degrees per year. Scientists expect the two to be in position to produce 3-D images by April 2007. 'Our ultimate goal is seeing solar flares and coronal mass ejections in 3-D to better understand their origin, evolution and determine whether or not they're a threat to Earth,' said Russell Howard, principal investigator for SECCHI, the imaging instrument suite aboard both observatories. Howard and his staff are a part of the Naval Research Laboratory (NRL) in Washington, DC. Coronal mass ejections, - giant clouds of plasma shot out into space by the sun and X-ray emitting solar flares are the largest explosions in the solar system and can pack the force of a billion megaton nuclear bombs. 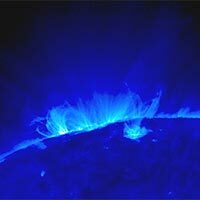 They are caused by the buildup and sudden release of magnetic stress in the solar atmosphere above the turbulent active regions we see as sunspots. The sun's million degree atmosphere taken on Dec. 4 by STEREO's SECCHI/EUVI telescope. The sun in light emitted at 1.5 million degrees C taken on Dec, 4 by STEREO's SECCHI/EUVI telescope. An image showing portions of the sun's atmosphere at 60,000 to 80,000 C taken on Dec, 4 by STEREO's SECCHI/EUVI telescope. When directed at Earth, CMEs can produce spectacular aurora and disrupt satellites, radio communications and power systems. Energetic particles associated with these solar eruptions permeate the entire solar system and may be hazardous to spacecraft and astronauts. Each STEREO observatory has 16 instruments. The PLAsma and SupraThermal Ion and Composition (PLASTIC) team, housed at the University of New Hampshire, Durham, N.H., started receiving data from its two instruments in early December. Researchers at the University of California, Berkeley, saw solar wind measurements from some of its In-situ Measurements of PArticles and CME Transients (IMPACT) instrument suite Nov.1. SWAVES the radio astronomy experiment, STEREO/WAVES, led by the Meudon Observatory in Paris, France obtained measurements just two days after launch on Oct 27. Goddard manages the STEREO mission and APL designed and built the spacecraft. APL will maintain command and control of the observatories throughout the mission, while NASA tracks and receives the data, determines the orbit of the satellites, and coordinates the science results. STEREO is the third mission selected for NASA's Solar-Terrestrial Probe Program.